Following the recent launch of the new Grafter Green 3.5 tonne truck range by Isuzu Truck UK, the Hatfield-based manufacturer has now added a selection of the new Grafter Green rigids to its current range of Driveaway pre-bodied vehicles. The first Isuzu Grafter Green 3.5 tonne N35.125 trucks, available in both single and twin rear wheel versions, with either tipper or drop side bodies, are now available from the company’s UK dealer network through the popular Isuzu Truck Driveaway scheme. Also added to the Driveaway range for the first time are Grafter Green N35.125 rigids fitted with a specialist Utilitruck body. This new model within the Isuzu Grafter Green 3.5t truck range has an impressive payload capacity, a TGS (UK) Ltd tipper body and secure tool pod for storing tools and equipment. “Since we launched our Driveaway programme several years ago, it has proved to be a successful route to market, providing our customers with significantly reduced lead times and no need for time-delaying type approval. Over 35% of our Isuzu Forward 7.5t retail sales now go through the Driveaway programme, whereas that figure rises to amazing 60% for our 3.5t Grafter models,” said Richard Waterworth, Head of Sales, Isuzu Truck UK, announcing details of the extension to the company’s Driveaway range. Isuzu Truck UK has partnered with some of the U.K.’s leading bodybuilders to develop a range of pre-bodied trucks from 3.5 tonne to 7.5 tonne within its current Driveaway range. These are proving to be particularly popular with construction and landscape gardening companies. The latest addition of the new Grafter Green trucks, which are the company’s lightest ever 3.5 tonne truck, to the Driveaway range, enables customers to benefit from even better payload carrying capacity. From Isuzu’s market leading 7.5 tonne truck range, there are seven different Driveaway vehicle options, all them featuring the popular Easyshift automatic gearbox. These vehicles include dropside, tipper, curtainside and box bodies, specified on either the Isuzu Forward N75.190 or N75.150 Urban chassis cabs. 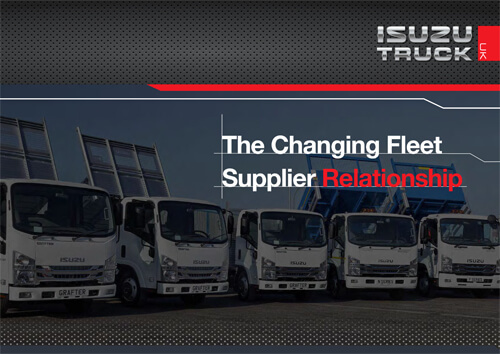 “Without doubt, the Isuzu Truck UK Driveaway programme has proved to be incredibly popular with our customers. By consistently adding new models to the range, we now have a comprehensive selection of the most sought-after vehicle specifications in various GVW categories, enabling our customers to reduce the lead time and costs for fleet replacements and additions,” commented Richard Waterworth.